I know there are several AR builders in the house.. Does anyone else have any experience building rifles/pistols from the ground up other than AR's? I've built a couple of single shot rifles over the years, but honestly there wasnt much involved other than some minor fitting and machining.. I turned a couple of H&R single shot 12 gauge shotguns into little 16" barreled .44 mag carbines back in the day.. and then turned another 12 gauge H&R frame into a single shot .45-70.. All three of these projects really only required me to tinker with the actions a little so that the rifle barrels fit flush, tap the receivers for scope mounts, etc..
More recently I stepped into bolt action builds though.. I took a 1937 VZ24 (large ring mauser) action that came off a completely ruined old Czech mauser (cracked stock, pitted bore, missing fore-end, broken trigger, etc), rebarreled it in .35 whelen, installed a timney low profile safety, reforged the bolt handle so that it would clear a scope, drilled and tapped for scope mounts, installed a timney trigger, and then fitted a boyds laminate stock to it (minor woodwork only.. it was about 90% fitted from the factory).... I took it to the range yesterday, about half worried it was going to blow up in my face.. but it performed really well.. flawless operation, and held about a 1" group @ 100 with hornady factory ammo.. The wife is pleased (the rifle was built to add a "mid-bore" to her arsenal.. I stocked it in a nice bright pink and black laminate for her.. )..
And am getting ready to build another rifle on a 1935 small ring spanish mauser action (I will most likely build this one as a 7x57/7mm mauser).. I'm also in search of another large ring action.. I'd love to come across another old VZ24 thats seen better days or a pre-war german K98 that has a shot out barrel, rotten stock, etc.. that I could salvage an action off of.. If I can source another strong action at a decent price I'm thinking I'll build that one into a .458 Win Mag..
Any other non professional gunsmith, rifle tinkerers among the membership here? I tinker around a little bit. Mostly making parts to get guns shooting, but also some woodwork. I'm getting set up for rust bluing. If you're using Mauser actions it's good to know the alpha-numeric codes on the front ring. BYF, S42, and a couple others indicate Mauserwerk Oberndorf which is top of the line. It pretty well accepted that quality never dropped at Oberndorf during the war so any action from there is GTG. There are a lot of rifles out there built on Argentine actions. Supposedly the Argentines are a bit soft and will suffer setback with lots of use or if chambered in the larger calibers. Doublegunshop.com and nitroexpress.com both have forums on gunsmithing that lean more toward custom guns. Currently I'm restoring the stock on a 8 gauge muzzleloader. I could see it was cracked when I bought it but it was actually in three pieces when I took it apart. Thank God for Acraglas. My next project is restocking an A.H. Fox shotgun and fitting a second set of barrels. It's a sickness. I'd rather buy a broken gun that I can bring back to life than a functional one. The only non-AR rifles I mess with are lever actions. Never built one from the ground up, but I have replaced a lot of old/worn parts on some classic older Marlins and Winchesters, to include minor fitting and filing. I'd rather buy a broken gun that I can bring back to life than a functional one. I think this is probably what I am enjoying most about tinkering around with these old mausers I have been playing with..
they were absolutely "dead".. never to be shot again.. Honestly both were in too poor of shape even to be considered wall-hangers (missing parts, pitted rust inside and out, broken external parts, etc..)..
Now one of them is shooting again, and the other is on the way to becoming a shooter..
Granted, I could buy a new Winchester 70 or Rem 700 for what I ended up having to invest in the VZ24.. and not have to put the labor into the project.. I could just walk out of cabela's and head straight to the range.. But I got some pretty serious satisfaction out of seeing a 1" group form a couple of days ago as a fruit of my labor.. Restoring an old lever gun is pretty high on my list right now as well.. I'd love to find an old Winchester 1892 that has seen better days and bring some life back into it.. Prior to working on the VZ24, my last project was trying (and not fully succeeding) to bring a Winchester 1890 pump gun back to life..
Its about 90% there.. but the stock still needs a good bit of work.. and the action isnt 100% reliable.. the bolt isnt locking up properly and Im getting about 50% failures to fire.. I havent quite figured out whats going on there.. but now that I've got the first mauser put to bed I might try to spend a little more time playing with it to see what I can do to "fix" it..
and LOVE winchester lever guns.. I've never really dug into one.. but if I could find one cheap that was in horrible shape and needed some TLC, I'd probably jump on it and see what I could do.. Lever guns are a PITA, which is why I like tinkering with them. The action, while cutting edge for the late-1800s, is complicated and prone to issues. I've built a couple M14's from the ground up, one is an LRB Arms receiver, the other a Fulton Armory. 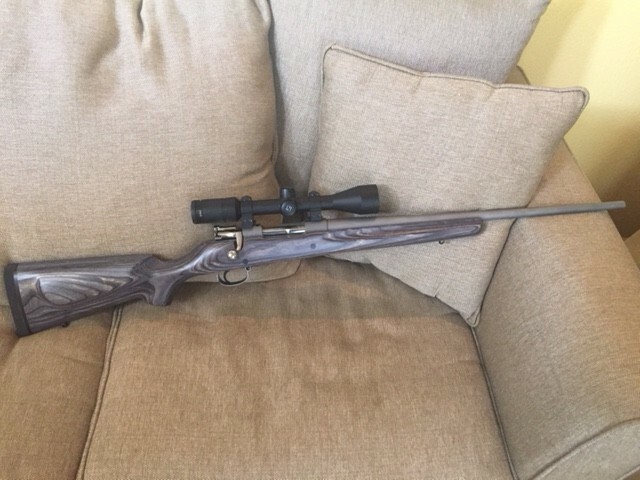 I rebuilt an old Savage Model 99F .250-3000 that was the wife's first deer rifle. It was in pretty bad shape, and took forever to find parts. But, I got it back running, and now it is literally a nail driver. The last one I had the pleasure of working on was an older Winchester .351 Carbine. I live to tinker around with these things. I have done a few AKs from parts kits and receivers but the most fun was a semi-auto Sten that I built with an OLD parts kit and basically a piece of piece of pipe and a new bolt. There was welding and drilling and a bunch of fitting but it is pretty neat. I am thinking about an 80% pistol next. I'm in the process of building the Frank De Hass chickopee centerfire single shot in 357mag. It has been a learning experience. I started with cold role steel plates and I have cut every piece out and fitted them. I think I have made every part twice. I have never worked steel like this before. I purchased a used drill/mill/lathe combo machine and have had to teach myself machining. I started working on the project last winter and I'm still tinkering on it. It's pretty much complete except for welding the breech block to the action, case hardening a few parts, and the finish of the steel. Forest Boy should be along soon, he is the gun smith in the group. Me, I prefer to shoot them. I am refurbishing an old Marlin 1894 chambered for .44 Magnum. 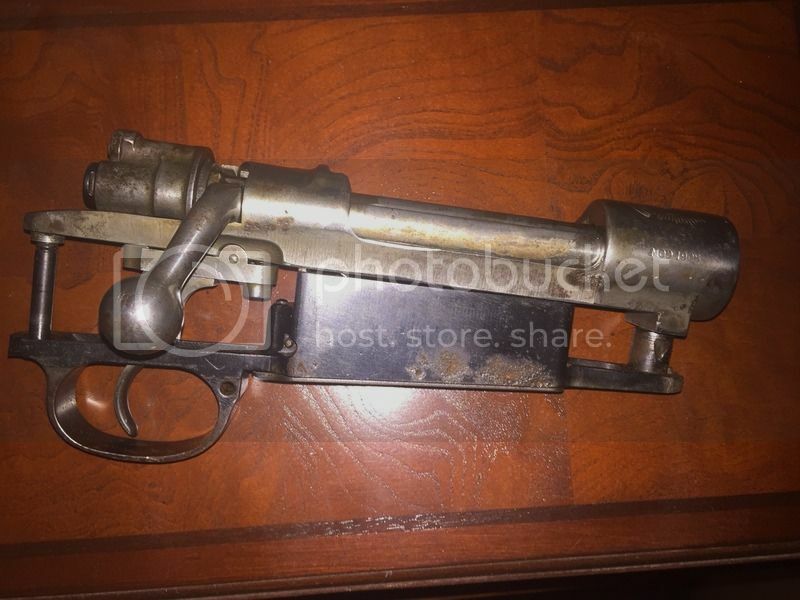 The gun spent about 20 years in a tin shed and was shootable but ugly when I got it. Now I have stripped it down and started rebuilding it by refinishing the metal and wood. AR-15 platforms have flooded the market and now I am mostly bored with them. Ordered all the parts for the small ring mauser build mentioned above this week.. they should all start coming in over the weekend.. Went with a dayton low profile safety, timney sportsmans trigger, and an adams & bennet barrel (7x57), and a boyds "classic" laminate stock.. I also picked up some warne maxima rings and bases (not that they will require any work.. they will just screw right in once I get the action drilled and tapped this weekend.. ).. I've already had the bolt handle reforged and the bolt and all if its components polished both internally and externally.. I'll drill and tap the action this weekend, and assuming the barrel gets here this afternoon like its supposed to will go on and screw it on tight with my action wrench and vise... assuming everything mates up correctly I'll order the finishing reamer and go/no-go guages this weekend, and then sometime next week do the final cut on the chamber.. While waiting on the reamer and gauges, I'll inlet the stock and fit it to the action.. If everything works out as planned I'll have a new "deer rifle" in the safe in a couple of weeks that I can play with all spring and summer before taking it to the woods this fall in search of venison..
Im seriously enjoying this new "hobby".. if any of you guys know where I can find a beater large ring mauser action on the cheap, I'm looking to build a .458 win mag next.. no idea why I want a .458 other than I just think it would be fun to build one..
got the chamber cut on the 7x57 last night.. I think this one might really end up being a shooter.. the bolt closes tight as a drum on the "go" gauge, but wont budge when the no-go gauge is dropped in.. I got a buddy to help make sure the barrel face was trued up perfectly with the face of the action before mounting the barrel (he doesnt work as a gunsmith, but actually got an AA in gunsmithing a few years back and has some very good skills, and a nice shop with a lathe, high end drill press, etc..)..
Also lapped the lugs, etc..
All that is left to do is drill and tap the action for scope bases, put a finish on all of the metal, and assemble the parts... Should know how it all turned out in a few weeks..
Also picked up another VZ24 action this week (a Czech/BRNO manufactured large ring mauser).. Ill wait a few months.. but am already pretty excited to start the .458 win mag project next..
Just thought I would share an update on my project. Im a builder, I have built four FN FAL 's from parts kits and Imbel Recievers and Four HK G3 parts kits on FMP recievers when you could still get them and I also built a UZI from a parts kits. Im into building a AR now but have a long was to go , Money issues. I'm on the road this week.. when I get back to the casa, I'll get some pics of the .35 and the 7x57 up.. I also picked up another large ring action a couple of weeks ago.. Its going to be a long project (6-12 months).. but as I get time, I'm going to turn that one into a .458 win mag.. I wont be able to do 100% of the work on that one myself.. I'm planning on sending the action to ER Shaw to have them do a "magnum" job on it.. they'll essentially open up the bolt face and cut back the rails a little bit to fit the bigger/fatter cartridges, and re-angle the feed ramp to more reliably feed the big, fat, flat .458 bullets..
Once that project gets up and running I'll post progress pics along the way. . The intent is to build my own rifle from the ground up.. develop my own load for it.. and then take "my" rifle and "my" cartridge on a Cape Buffalo hunt by June 2019 (50th birthday present to myself)..
What it used to look like: (CETME 1893 Spanish Mauser Originally manufactured in 1902, converted sometime after 1951 to .308 and issued to the Spanish Civil Guard).. By the time I got it the bore was pitted, barrel rusted out, superficial rust was on the bolt and action, it was stock was cracked, etc..etc..).. pic is not my mauser.. I didnt take any "before" pics.. but is pretty close in appearance to what I started with.. info however is my gun (I ran the serial number, tried to get some history on the gun, etc. before taking tools to it..)..
Im hitting the annual "swap meet" at the Shilen Barrel factory this weeken.. hoping I find a deal on a .458 win mag barrel threaded for a large ring mauser action.. I've got a couple of AR15 builds I want to complete next.. but I plan on tinkering with the .458 project here and there over the next 6 months, and hopefully will have another big bore in the safe before the end of the year..
Just got my hands on a brazilian mauser action (Oberndorf built in 1935)... going to start another build soon.. and hope to have a 416 Taylor in the safe before the end of the year.. The plan to find a 458 win mag barrel at shilen was a failure.. instead my wife found a match grade 270 barrel.. and we ended up building her another rifle..
Last edited by mdwest; 5 July 2018 at 20:35.